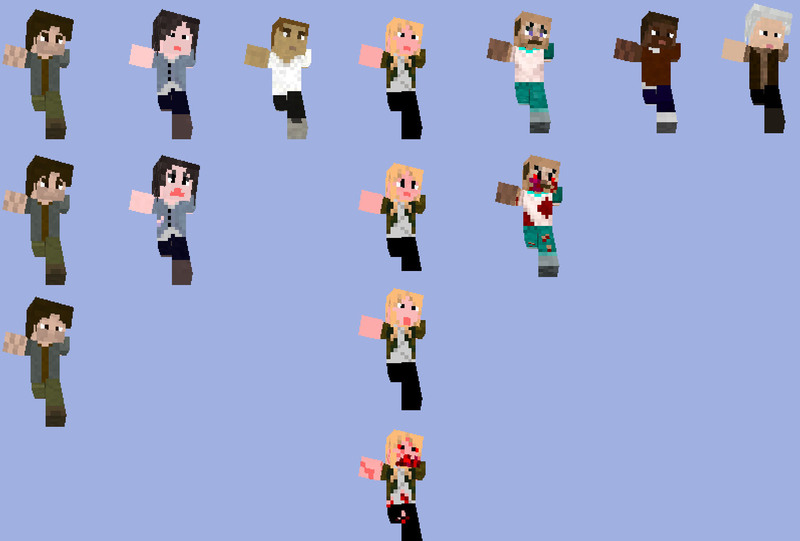 Here are all the skins done so far next to each other. This is not including the generic zombie skins. Image is quite large, click it to view all the skins. Just um..wondering, If we are going for detail, why is the blood on the zombies all the same? maybe a little variation? DaBawsh wrote: Just um..wondering, If we are going for detail, why is the blood on the zombies all the same? maybe a little variation? Yeah I know it's all the same, it was easier to do it that way. You don't really see that much of the zombies so hopefully it won't matter that much. If it turns out it does matter we can easily change it and re-shoot the couple of scenes that they are in. Sorry :s forgot about those skins. I will add them to the zip file above.